The numbers on the bottom are browser widths (minus 40), and the numbers on the side are the counts of unique visitors with that width. At the time this blog posting was made, my blog had hand-drawn borders in the page title. They were generated by a CGI program on the fly. For each visitor, a number about 40 pixels below your browser width is recorded in my server logs. I wrote a perl script to create a histogram for unique visitors, and pasted the result into gnumeric to create the chart. 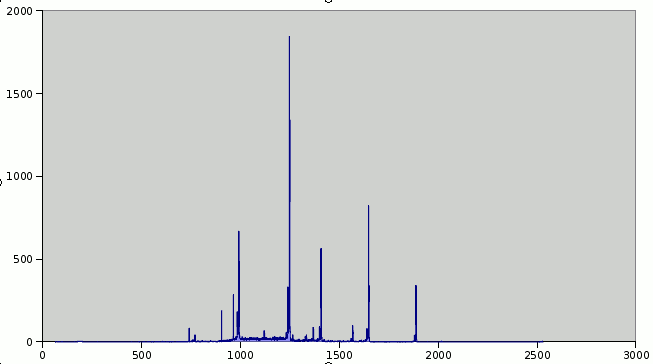 The peaks seem to correspond to 1024, 1280, 1400, 1600, 1920 screen widths, with 1280 being the greatest peak. This indicates that most people have their browser window maximized. There is also a section of uniformity between 1000 and 1280. This seems to be a sweet spot among those who do not maximize their browsers. Surprisingly, there are still a few people running at 800x600 resolutions. And one at over 2500 pixels across. If the column is too wide for you, you are free to adjust the width of the browser window to your liking. Pixel size doesn't matter. The size of the human head does. The main text on the screen should be no wider than the width of a human head, 50-60% of the screen width. This eliminates head movement and keeps the text within the peripheral vision of most people, reducing eye movement. Ask yourself this: Do newspapers, magazine, dictionaries, encyclopedias and other print media have text across the full width of pages? Or are they printed in columns? If it's any wider, it forces the reader to move his head or eyes and becomes annoying to read. If a site designer wants people to read the site and come back, he should make it comfortable to visit. For example, the main text on this blog looks fine on my netbook (1024x600) but is too wide to read comfortably on my 15" laptop screen (1366x768). These numbers are misleading though -- just because people have large monitors doesn't mean they browse with the window maximised. The best thing about a widescreen monitor is having two apps open side by side (like two columns) -- It's always *really* annoying when a site forces horizontal scrolling (or maximise). Text line lengths can get waaay too long on a maximised, large screen (making it harder to read), so I actively avoid maximised browser windows. Your page should be just as wide as the client area of the browser. No wider, no narrower. Seriously, it isn't that hard - get coding! NIce. 1280 is definitely dominating, but what this chart doesnt show is how high that category used to be and at what rate it is decreasing. 1600 has really picked up steam. Maybe its best to make 1600 and add horizonal scrollbar. 1600 is growing fast. A while back I thought it would be interesting to be able to draw arbitrary waveforms and then listen to how they sound. I had an audio engine just laying around, so I whipped up a quick application to do that.